At Bartlet & Richardes LLP, several lawyers practice within the Corporate/Commerical group serving the legal needs of our clientele ranging from sole proprietorships to international corporations. This group possesses expertise in specialized areas. 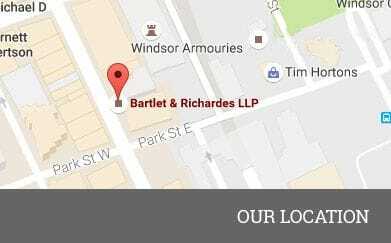 Bartlet & Richardes LLP has been a provider of a full range of labour and employment law services to clients throughout Ontario for over five decades. A number of lawyers in the firm have expertise in advising clients about planning estates, drafting simple and complex wills, establishing trusts and administering estates. Bartlet & Richardes LLP provides a wide range of services to clients involved in or with the construction industry, from suppliers and contractors engaged in the industry on a full time basis, to property owners dealing with members of the industry on a single project basis. Members of the firm practice in the area of computer licensing, copyright and trademark. Since 1984, Bartlet & Richardes LLP has had a substantial practice in the area of Family Law with an emphasis on dispute resolution through negotiation and mediation, or when appropriate, by aggressive litigation.